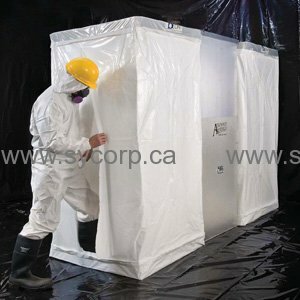 D-Con eliminates the hassle and cost of constructing a temporary decontamination facility on site. The D-Con sets up quickly and easily reducing labor cost. It is the first all poly constructed unit, which means it can withstand the daily rigors of abatement projects without losing any structural integrity. All D-Con units are made from two layers of 6-mil poly and have triple-flap ingress/egress doorways. The D-Con is available in several different configurations, from a basic two room kit that is used with traditional aluminum “pop-up” showers, to an extra large, fire retardant 3-stage unit that meets the NY city code for disposable shower enclosures. Each 3-stage configuration is also available in fire retardant polyethylene construction. Support poles, drain water pick-ups and shower nozzle hardware are reusable and available separately.